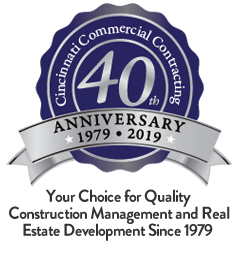 Cincinnati Commercial Contracting was founded by John Westheimer in 1979 to provide clients with full-service commercial construction management and real estate development expertise. From the beginning, John and the CCC team were committed to the highest standards in craftsmanship and client services. Today, that legacy continues. It’s your vision, your business, your future. Our first role is to listen to what you want and need, to learn how CCC can help you. Whether you have custom designed plans or come to us to help determine the type of space that will work best for you, Cincinnati Commercial Contracting can take your dream and make it a reality. Our professional team works throughout Ohio, Kentucky and Indiana on commercial projects that include everything from retail, restaurant and hospitality buildings to industrial, warehouse and office complex. The CCC team of professionals know that bringing each job in on-time and on-budget is the standard all clients deserve, and should always expect from their builder. Our client focused approach takes that much further: CCC partners extensive construction experience with technology and excellent project planning to make the building process a solid success.